July 10, 2014 · by Zack Reyes · Post may contain affiliate links. See my disclosure policy here. There are several places where Oil of Olay coupons can be found. You can find Oil of Olay coupons in your Sunday newspaper inserts quite often, via online printables and even on packages of Oil of Olay products. 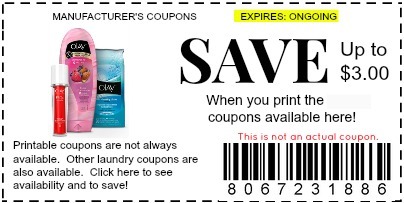 The most common place to find coupons for Olay products is in the monthly P&G coupons insert. Each month, there are usually quite a few Oil of Olay coupons in this bad boy. You can find coupons for the Olay Regenerist line, the standard Olay products like body wash and facial cleansers. They also have Oil of Olay coupons out for their higher end line, the Pro X product line. The coupons for the Olay Pro X line tend to be higher in value. I can remember seeing coupons for Pro X products for as much as $10 off of one product! The Regenerist coupons can get fairly high in value as well. That being said, coupons have taken a sad turn due to misuse and values are tending to be lower. This is even more incentive to try and combine coupons with store sales and promotions. Oil of Olay coupons are easy to combine with sales, especially at drugstores. It seems that just about every week a different drugstore has some awesome promotion on Oil of Olay products. Also, look out for Target offering gift cards back when you purchase a certain amount of Olay products. The nice thing about these types of deals is that you can use Oil of Olay coupons at the time of purchase, thus lowering your out of pocket cost. Oil of Olay coupons can also be found online quite often. This site will have all coupons offered by coupons.com, which often include Oil of Olay products. I encourage you to check out this site's homepage often. Bookmark it even! You'll find Oil of Olay coupons in addition to tons of other beauty, personal care and grocery coupons.